Four-channel microphone mixer delivers superior performance and excellent sound quality with low noise and a flat frequency response. 4-channel microphone mixer delivers superior performance and excellent sound quality with low noise and a flat frequency response. Includes 4 transformer-balanced inputs, 5 -10 dB line-level inputs, 12 volt phantom power, and built-in low-cut filter. The Shure SCM268E microphone mixer offers great value and features six transformers inside: four transformer balanced XLR microphone-level inputs, one transformer balanced XLR mic/line output, and one internal low stray field, toroidal power transformer. All the audio transformers provide protection from RF interference, prevent ground loops, and make the SCM268 exceptionally quiet. The internal toroidal power transformer means you no longer have to deal with that annoying "wall wart". Add to this a rugged half-rack chassis, with exceptionally solid rack mounting hardware -- and the SCM268 will easily fit into the widest range of smaller applications. 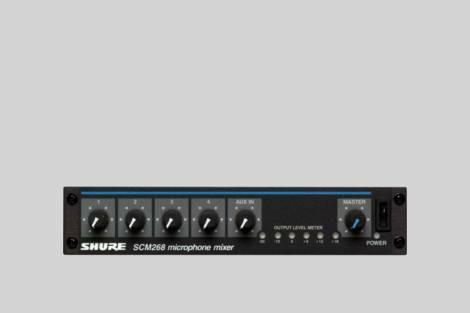 The SCM268 is ideal for Meeting rooms, Houses of worship, Broadcast, Educational paging and public address. If you want half a dozen transformers in a half-rack space, choose the SCM268.